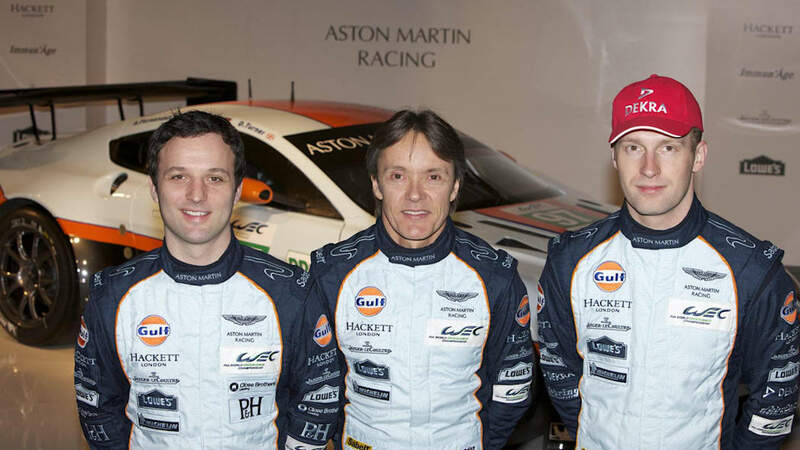 Few outfits have benefited from the kind of success that Aston Martin Racing has enjoyed. The team has emerged as an absolutely dominant force in the numerous GT classes of endurance racing around the world. But Aston's success arguably went to its head a little, prompting AMR to abandon its GT racing program to privateers as the team itself attempted to step up to the top-tier LMP1 class with the AMR-One. That ended up a fool's errand that yielded none of the success to which the Prodrive squadron had become accustomed. So after three years nipping at the heels of Audi and Peugeot, AMR has announced its return to production-based GT racing with this, the Aston Martin Vantage GTE. Designed to comply with the amalgamated GTE Pro class regulations set out by the ACO and FIA for the 24 Hours of Le Mans and the new World Endurance Championship, the Vantage GTE is based on the V8 Vantage, but upgraded considerably to competition spec. Its aerodynamically optimized carbon fiber bodywork – draped in iconic blue and orange Gulf livery – packs a 4.5-liter V8 with a six-speed sequential transaxle and adjustable everything to optimize the package for specific race tracks. The team will field one car at each of the races on the WEC calendar – from its debut at Sebring on March 17 through Spa, Silverstone, Sao Paulo, Bahrain, Fuji and Shanghai – with a second car to join at Le Mans in June. Follow the jump for the full press release and video clip, check out the high-res images in the gallery for a closer look. 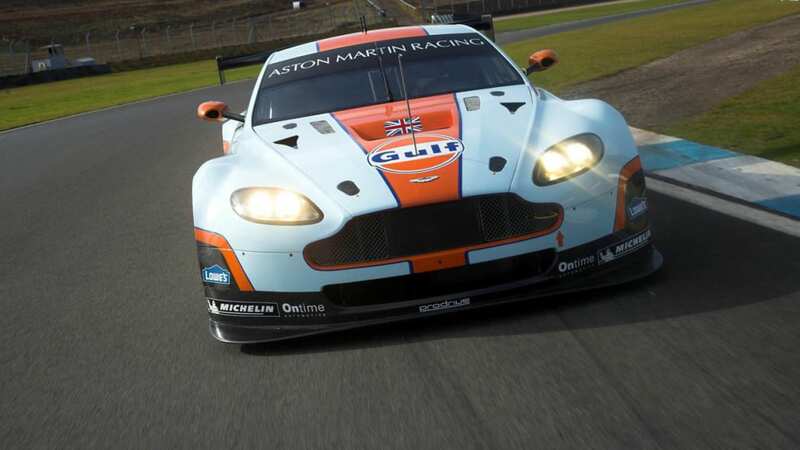 Gaydon – Aston Martin Racing will embark upon an exciting new challenge in 2012 as it prepares to make a return to international GT motorsport in the FIA World Endurance Championship. The team will campaign a V8-powered Vantage in the GTE Pro category of the eight round series, which spans three continents. At the third round of the championship, the 24 Hours of Le Mans, Aston Martin Racing will field a second works Vantage GTE. Aston Martin Lagonda Chairman David Richards shared his enthusiasm for the new project: "It's great to be returning to our core motorsport activity; production-based GT racing. 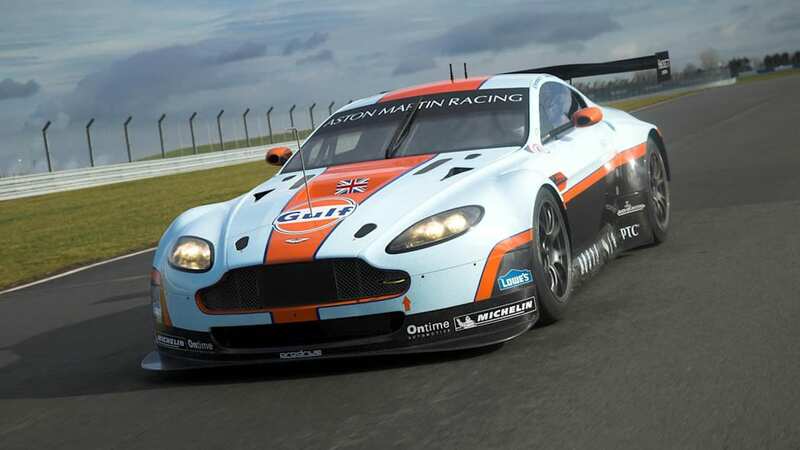 It formed the basis for Aston Martin's return to competition when the DBR9 GT1-racer was launched in 2004, and it was in GT racing that we achieved our famous victories at Le Mans in 2007 and 2008. "The GT category is also now the most competitive class in world sports car racing and with the new FIA World Endurance Championship the GTE class will, I believe, offer the closest fought and most exciting spectacle. We will see many premium sports car brands competing with great sounding racing cars based on their production models, which all the fans can relate to." At the heart of the Vantage GTE is the road-going Aston Martin V8 Vantage. 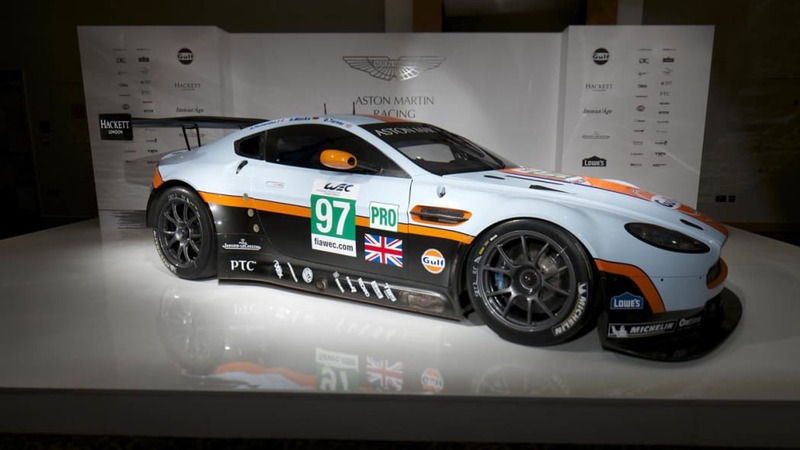 The GTE is a significantly updated version of the original GT2 car and has been specifically designed to compete in championships running to the Automobile Club De L'Ouest GTE regulations. Under the bonnet, the engine is based on the standard Aston Martin V8, but with competition components including cylinder heads, connecting rods, valves, camshafts and a racing exhaust system. As in the road car, the transmission is mid-rear mounted, but with a six-speed semi-automatic sequential transmission and competition clutch. The transmission also has a dedicated oil/air cooling system. The bonded aluminium structure is taken directly from the V8 Vantage road car. 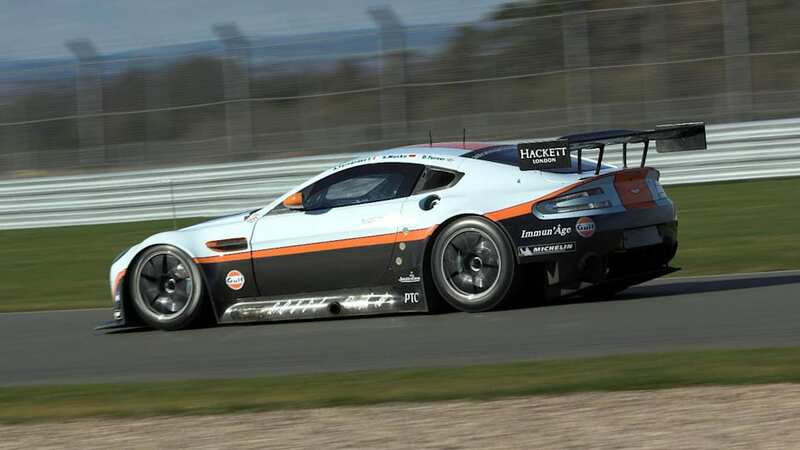 Into this, Aston Martin Racing integrates an aerospace specification steel roll cage built to FIA standards. With the exception of the roof, the bodywork is manufactured from lightweight carbon fibre and features an advanced aerodynamic package with carbon fibre splitter, flat floor and diffuser, and a carbon fibre rear wing designed using the latest computational fluid dynamics (CFD) techniques. The Vantage GTE retains the road car's double wishbone suspension layout at the front and rear, but with bespoke wishbones and coil springs over Koni adjustable aluminium bodied dampers. Powerful but lightweight six-piston Brembo racing calipers are fitted to the front axle with similar four-piston calipers at the rear. 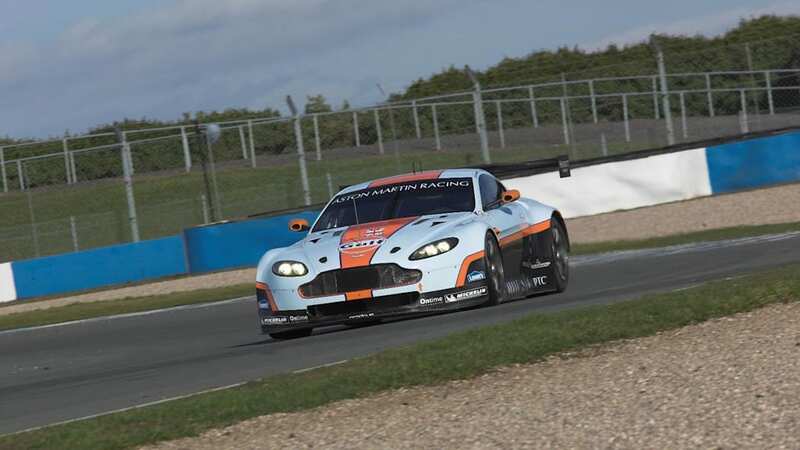 Aston Martin Racing's decision to enter the FIA World Endurance Championship will ensure that the brand continues to compete at the very highest level of endurance sports car racing. As of the 2012 season, all of Aston Martin Racing's competition cars are based on the road-going Vantage, reflecting its status as the sportiest car in Aston Martin's model range. Factory driver Darren Turner said: "I'm excited about this programme as it's our opportunity to take Aston Martin back to the top of the world of GT racing. The Vantage GTE is a great car; she's coming along nicely now and we're ready to take on what we expect will be tough competition. The FIA World Endurance Championship calendar looks good to me, especially as I've already won in an Aston Martin at half of the tracks: Sebring, Silverstone, Interlagos and of course at Le Mans. We are going to Sebring next month with a brand new car, but that's exactly what we did with the DBR9 back in 2005 and we won that race. I'm not promising we can repeat that but we'll certainly try!" Team-mate Stefan Mücke explained the team's ambitions for its first year in the FIA World Endurance Championship: "I'm really looking forward to racing the Vantage GTE and I'm optimistic that the car will be competitive. We always aim high and target podium finishes at every race, but we are also determined to prove the speed and reliability of the Vantage GTE in 2012."